With bye weeks in the rearview mirror, teams will have to battle through injury attrition as both the fantasy and NFL playoffs approach. Week 12 only added to the list of those hurt on the field, including a number of stars at skill position. With each game growing in importance, here is everything to know regarding the major injuries in the NFL. After talking coaches into letting him play on Sunday morning, Melvin Gordon subsequently sprained him MCL and did not return to the game. The Chargers indicated on Monday that Gordon suffered a Grade 2 MCL sprain and will miss a few weeks. 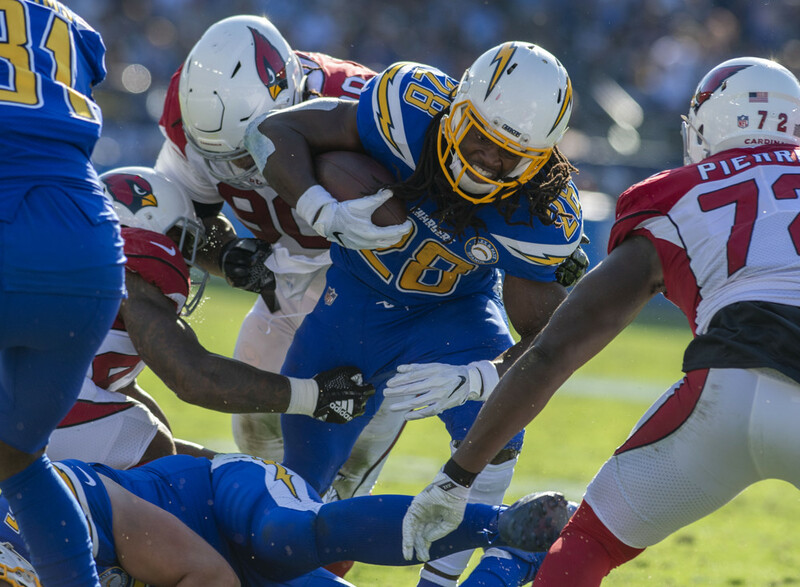 The Chargers will likely play it cautious with their star running back as they approach a playoff berth. Gordon will remain week-to-week until further notice. Leaving Sunday's game with a thumb injury, the Bengals placed Andy Dalton on injured reserve on Monday afternoon. Dalton reportedly suffered torn ligaments in his thumb, leaving surgery on the table. With another lost season in Cincinnati and zero dead money on the line, Dalton's future with the team looks questionable at best. After a promising start, Marlon Mack left the Colts' games with a concussion. Mack will have seven days to pass each stage of concussion protocol before the Colts' Week 13 game. For now, he should be considered questionable. Aggravating a pre-existing shoulder ailment, Kenyan Drake missed the final portion of Miami's game. Adam Gase announced that Drake will begin the week in a non-contact jersey, offering little tangible information about his status. Drake began last week in similar fashion before suiting up, so he should be considered probable for now. A surprise inactive, Evan Engram reportedly pulled his hamstring prior to Sunday's game and couldn't gut it out. Giants' beat, Jordan Raanan reported Engram is optimistic about his chances of suiting up next week. He also noted that Engram could have played in an emergency situation last week. For now, Engram looks likely to play, but hamstrings always need to be monitored until kick off. Coming out of no where, head coach Frank Reich announced that the Colts placed Jack Doyle on injured reserve with a kidney injury. Reich also noted that Doyle underwent a procedure to remedy the issue, but his prognosis looks positive. Doyle should return for 2019, but the Colts will roll with Eric Ebron in the interim. Suffering a bone bruise in his knee in Week 10, Marvin Jones initially looked like he would return this season. However, the Lions chose to end his season by placing him on injured reserve. Jones should be fully recovered for offseason activities and act as the Lions' number two receiver next season, opposite Kenny Golladay. After appearing likely to suit up early in the week, A.J. Green ultimately missed Week 12 with his troublesome toe. Green didn't practice last week, but he appeared closer to playing. Supposedly targeting a Week 13 return, Green should be considered questionable to start the week. With Andy Dalton on injured reserve and the Bengals' season lost, Cincinnati has no reason to rush back their star receiver. After hurting his thumb in Week 11, DeSean Jackson ended up playing in Week 12. However, Jackson's injury continued to cause him problems and he will visit a specialist early this week. This does not bode well for Jackson's playing prospects going forward. He should be considered questionable for the time being. On a positive note, the Patriots activated Rex Burkhead from injured reserve after he sustained a neck injury early in the year. Burkhead is eligible to play in Week 13, but his offensive role remains unclear. It is possible the Patriots turn to a three-man rotation at the running back position consisting of Burkhead, Sony Michel, and James White.